Following the old adage “many hands make light work,” the 100-plus members who comprise the Sunbonnet Sue Quilt Guild have been stitching their way to gossamer proportions, creating beautiful fiber artwork in Vero Beach over the past 40 years. Despite their obvious artistic elements, quilts have always been integral to the fabric of life, born out of the necessity for warmth. 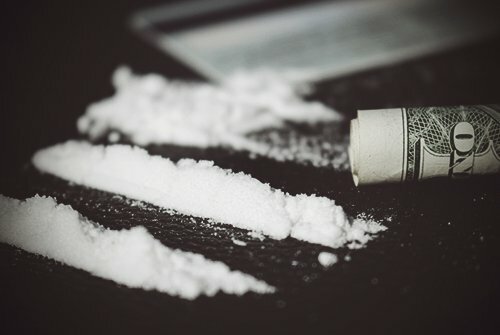 It wasn’t until the onset of the Pop Art movement, which pushed the boundaries of acceptable content and material, that quilting was finally elevated as “art” under that expanded definition. Through those initial stitches, the Sunbonnet Sue Quilt Guild was eventually formed to preserve the heritage of quilting; be a source of education, information and inspiration; and perpetuate a high quality of excellence in quilting. One of the guild’s endeavors is their biennial quilt show. 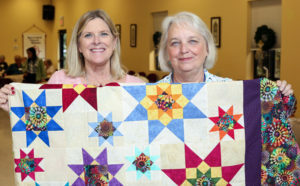 The 2019 Sunbonnet Sue Quilt Show: Treasures of the Treasure Coast will be held at the Indian River Fairgrounds Feb. 7, 8 and 9 from 10 a.m. to 4 p.m. Admission is $10 for one day or $15 for a three-day pass. Proceeds from the event will benefit the Love of Paws, which provides a sanctuary to pets of seniors no longer able to care for them, and a pet food pantry for seniors in need. Sunbonnet Sue Quilt Guild. Kathleen McGinn and Linda Gibson-Glass. Quilt show co-chairs Diane Miller and Cindy Baron are excited about this year’s event which, in addition to presentations and demonstrations, will feature 26 vendors showcasing everything from material to mats and machines. More than 200 quilts will be on display, 140 of which were considered in a judged show. Guild members have created a collaborative masterpiece quilt that will be displayed and auctioned during the show. Raffle tickets can be purchased for $1 each. Although members were initially unaware of the city’s Centennial Celebration when the project began, the quilt landed center stage with its Vero-centric focus on images of the Barber Bridge, crabs, frigates, sea turtles and sandcastles. 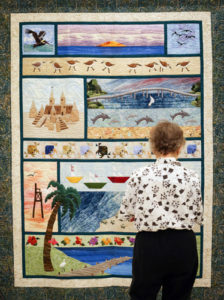 “A Day at the Beach” has since been labeled the Centennial Celebration Quilt. Sunbonnet Sue Quilt Guild. 1948 Singer Featherweight. Additionally, Cherrywood Hand Dyed Fabrics annually hosts a Cherrywood Challenge, asking artists to create a unique piece of art using a prescribed color palette, based on a specific theme. The 2018 ‘Prince Exhibit’ was selected as the inspiration behind the quilting competition and will also be on display. Guild meetings – think modern-day quilting bees – are held at 9:30 a.m. every Thursday at St. Augustine Church. Classes are taught, guest speakers brought in, and quilt-centric sessions organized to help the women further their sewing skills. Many bring handwork, tatting, crocheting, knitting or piecework to keep their hands busy during the business portion of the meeting. 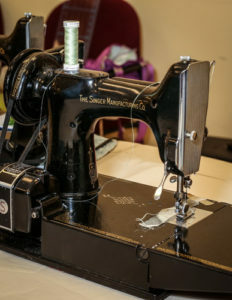 And while most are drawn in by their love of quilting, they stay for the camaraderie, bonding over projects, social interactions and the reactions of like-minded stitchers during show-and-tell sessions. The women who make up the guild membership are “cut from the same cloth” in their shared fabric obsession, using the medium of thread and cloth to create a colorful hybrid of art, craft and design. The group exhibits a literal patchwork quilt of expertise and ages, with professional backgrounds as colorful as the fabrics they piece together. 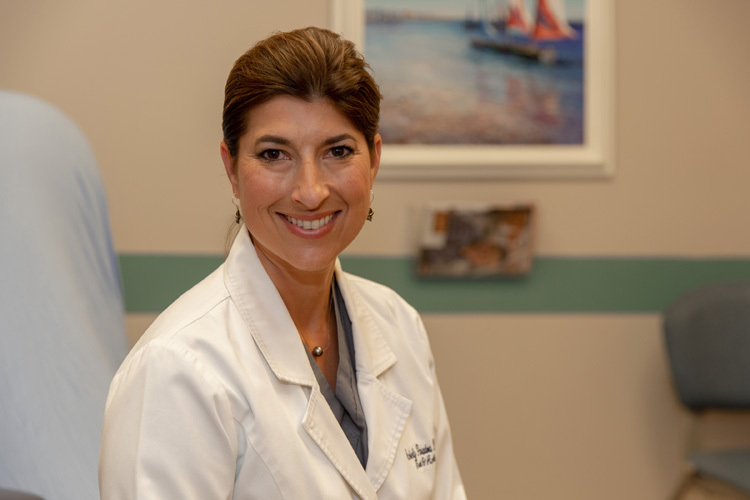 Members run the gamut from beginner to expert and range in age from 40 to 92. Jim Bell, the eldest member, began quilting in 1951 when her son was born, and has been a guild member since 1995. A creative person by nature, she also does needlepoint and stained glass works. “If you don’t have a needle in your hand you go crazy,” says Bell, who quilts for five or six hours a day. Jackson says she has been quilting for nearly 30 years, creating large tapestry-size quilts that hang on her walls. “It adds so much warmth to a home,” she says. 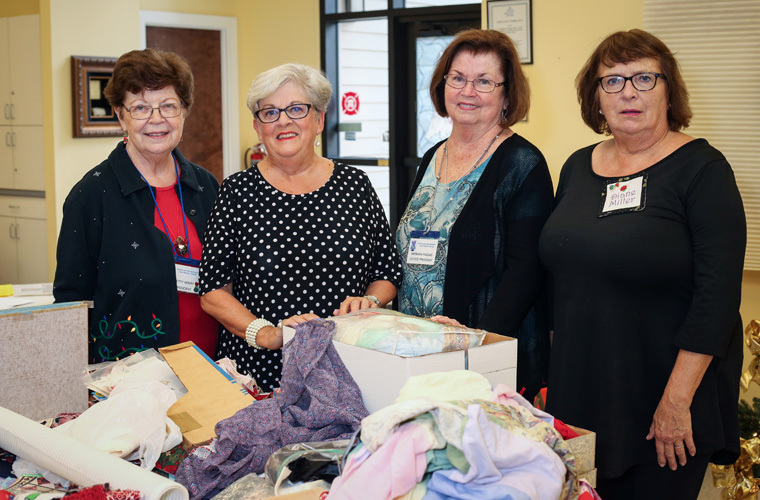 In addition to creating art to share with family and friends, guild members also find joy in service to the community through charity sews – providing therapeutic quilts to those in need and donating specialty quilts to organizations for fundraisers. 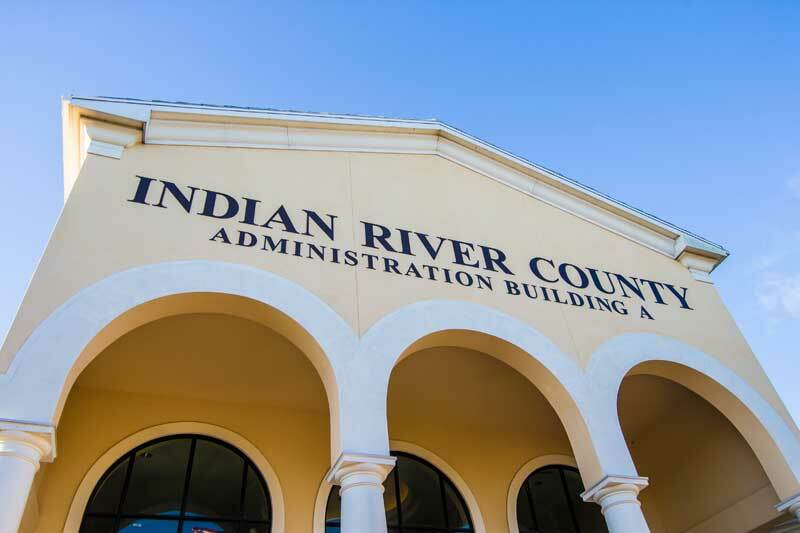 Over the years, the guild has designed and donated quilts to the Pelican Island Audubon Society, Children’s Home Society, Environmental Learning Center, Indian River County Administration Building, McKee Botanical Garden, Samaritan House, the Veterans Council of Indian River County, and local nursing homes. Additionally, guild members have made roughly 1,500 quilts and more than 1,000 teddy bears for the Indian River County Sheriff’s Victim’s Advocate Unit to use with children and families in crisis, created fidget quilts to provide sensory and tactile experiences for dementia and Alzheimer patients, designed port bags for chemotherapy patients, made pillowcases for hospitalized children, created weighted blankets for children with autism, and placemats for Meals on Wheels and Our Father’s Table clients. For more information email vbsonbonnetsue@gmail.com.